Yesterday I told you about some of the titles that we received in the Tiger Tales Books Fall 2012 release box. I promised that today I would tell you about our top three favorites and mentioned that I had copies to give away! Everything I said was true. ;) These three titles were our top three favorites from the fall line up and I have a copy of each one to give away to one of you! So, which titles were our favorite? 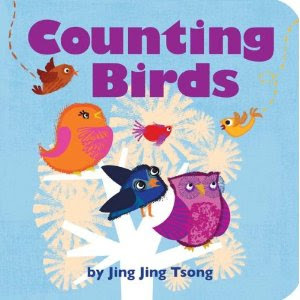 Counting Birds by Jing Jing Tsong is - hands down! - Bookworm3's favorite. This is a counting book which is quite catchy in that it tells a little story of the birds on the singing tree in a sing-song fashion. One bird singing in the singing tree. Tweet, come sing with me! Two birds singing in the singing tree. Tweet! Tweet! Three birds singing in the singing tree. Tweet! Tweet! Tikka-ka-ka! And so on and so forth with new birds making distinctly different noises to accompany each numbered page spread. In the end, there is one cat napping in the napping tree which is a bit of a surprise. Bookworm3, at age 18 months, absolutely loves this book. There are not many which she will sit and ask for multiple re-reads of, but this is one of them. Her brothers weary of it. The Really, Really, Really Big Dinosaur is quite popular with my boys (ages 3 and 6) because it is about dinosaurs and one of the dinos is a "bad guy." They don't quite get the fact that this is a story about bullies. There is a really big dinosaur who wants to steal the little dinosaur's candy. The little one insists that this must not be done and mentions that he has a really, really big dinosaur friend who will protect him. 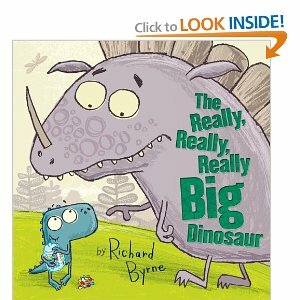 The really big and greedy "bad guy" dinosaur ends up learning that he's not the biggest, baddest guy in the bunch. Honestly, I feel sorta "meh" about the storyline but at the same time, I do not object to it. The boys like it a whole heaping lot and we're ok with it so it made it to our top favorites list. I mentioned yesterday that David Conway had a new book out and this is it! 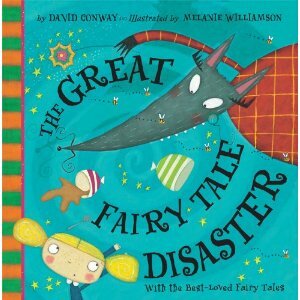 The Great Fairy Tale Disaster is like The Great Nursery Rhyme Disaster in that it has a disgruntled fairy tale character being displeased with its own story. In the case of this new title, the big, bad wolf is tired of being so big and bad and tries to find another fairy tale to join in on. In the end, he too is contented enough with hopping down the chimney one more time. Or two. This one is very cute and since I tend to like fairy tales more than I like reading nursery rhymes, this is one that I am content reading over again. As this title is liked by all - it is our top favorite book from the latest releases from Tiger Tales. The happy news, of course, is that Tiger Tales has offered to give away one copy of each of these three titles to one of you! Would you care to win? Simply leave a comment below - including a valid e-mail address! - saying so. This contest is open to U.S. Residents only and will be open through Thursday, November 15th. THIS CONTEST IS NOW CLOSED. THE WINNER, as selected by Random.org IS #6- BLUEROSE. Congrats! Thank you, Tiger Tales Books, for sending copies of the above title my way in exchange for my family's honest opinions of them. Thank you also for providing additional copies of the above three titles for one of my readers! These would make great gifts for my kids or their friends! I would love to win. These books look great. Thanks for the chance.